In this set of exercises the student builds a computational model of a simple plane rigid pendulum using the Euler-Cromer numerical scheme. The student is guided to explore the accuracy of the computational model, and to compare the computational results with the popular analytical solution for the pendulum via the small angle approximation. 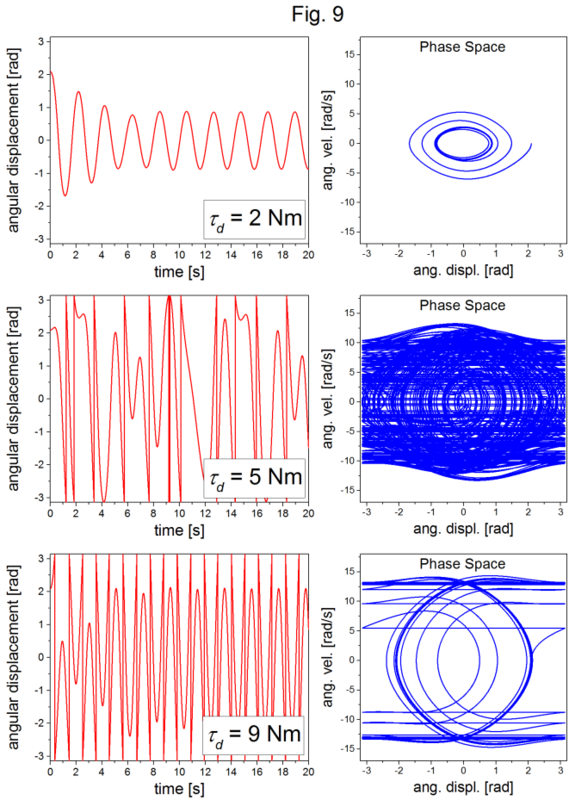 Damping and driving terms are added to the computational model, and the student is lead to discover chaotic trajectories in phase space. For this Exercise Set, I have chosen a rigid pendulum, rather than a mass suspended from a massless string, so that angular displacements of magnitude greater than π/2π/2 can be studied, without concern for the mass remaining at the same location relative to the support. The stable Euler Cromer method is employed; however, the instructor could have the students start out with an “Exercise 0” that asks students to use the simple Euler method to model the pendulum. 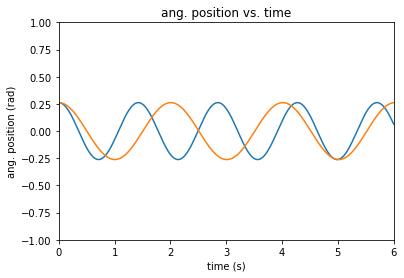 The Euler algorithm is unstable for oscillatory systems (total energy grows every time step), and this exercise could provide a valuable lesson in the control of artificial behavior in computational models, and the importance of using stable algorithms. Even if this “Exercise 0” were implemented, it might be best if students have already had experience modeling and studying the dynamics of a simpler oscillatory system, such as the Simple Hanging Harmonic Oscillator in the PICUP collection, before encountering the Rigid Pendulum exercise set. Exercise 1 asks the students to build the computational model of the hanging spring-mass system. Depending on instructor preference, a working version of the computational model could be directly provided to the student; or the student could be required to modify, or add to, a nearly completed computational model; or the student required to build the model from scratch; or really anything in between these scenarios. Another possibility for producing a working model, time permitting, is to build it, or parts of it, together with the students in class. To carry out the subsequent exercises the student must have the working program, and also access to either a plotting program, or a programming environment with built-in graphics capabilities. The student should be made aware of the analytic solution of the (undamped and unforced) rigid pendulum accessible via the small angle approximation. The second exercise in this set has the students compare this small angle solution to their computational one. Also, the concept of phase space is presented in the exercises as simply another way of plotting and observing the system dynamics. Adding the damping and driving terms in exercises 4 and 5, and guiding the students to explore the behavior for different parameter values, serves as a basic introduction to nonlinear dynamics. This computational approach to the rigid pendulum has the educational advantage of allowing introductory students to study the dynamics of a nonlinear, chaotic system with relative computational ease. 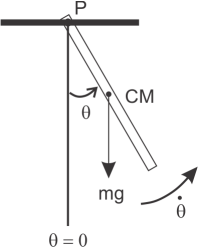 Consider a uniform rigid bar of mass mm and length LL that has been fastened to a stationary support at point P, as shown in the figure below. Assume that the bar is constrained to rotate in a 2D vertical plane when it is displaced from its vertical equilibrium position and released. for the rigid damped driven pendulum. See the pseudocode for the implementation of the Euler-Cromer algorithm for solving Equation 77. Build a computational model of a plane undamped, unforced rigid pendulum using the Euler-Cromer method. Assume your pendulum consists of a rigid metallic rod, one meter in length, with a mass of 1kg. Also assume that one end of the rod is fixed to an immovable support, and that the rod is free to rotate without bound in a plane. For initial conditions, assume the rod is displaced at some angle, greater than 90∘90∘, relative to its vertical minimum potential energy configuration, and released from rest. This physical situation has no exact analytical solution with which you will be able to compare the results of your computational model, so you must carefully determine a value of ΔtΔt that produces an accurate approximation without the benefit of making a comparison. Describe in detail the procedure you used in arriving at an acceptably small value of ΔtΔt, show plots of the angular displacement and angular velocity as functions of time, and comment on the pendulum’s dynamic behavior. Is the behavior of your computational model what you expect for a real pendulum? for the rigid pendulum, resulting from the small angle approximation. Comment in detail on your observations. A very useful plot for analyzing periodic systems is known as a phase space plot, and is simply a graph of velocity vs. position. The resulting curve is known as a phase space trajectory. In the case of the plane rigid pendulum, the phase space trajectory is found by graphing angular velocity vs. angular displacement. Produce a phase space plot for the plane pendulum using the parameters and initial conditions you used (including an accurate value for ΔtΔt !) in Exercise 1. Comment in detail on the resulting phase space trajectory. Now, add a damping term to your pendulum model. Explore, and produce graphs of (time dependent behavior as well as phase space), the behavior of the model by systematically varying the damping strength bb . Use the same values for the physical parameters and initial conditions as before. Describe the effect of increasing the damping strength, while keeping the other parameters the same. Can you damp the pendulum to such an extent that it doesnâ€™t actually oscillate? Next add a driving torque to your pendulum model. Once you’re sure that your model is accurately computing the damped, driven pendulum’s dynamics, systemically explore the behavior of the model by varying the driving torque amplitude τdτd . 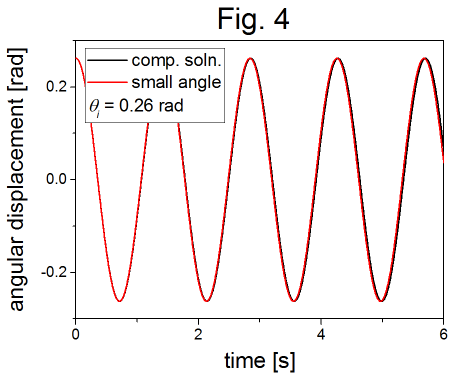 Use the same physical parameters and initial conditions as before, including values of bb = 0.2 and ωω = 3 rad/s for the damping strength and angular frequency of the driving torque, respectively. Then, vary the magnitude of the driving torque amplitude from 2 Nm to 10 Nm, in 1 Nm increments, producing time-dependent and phase space plots for each value of τdτd. For the time-dependent graphs of angular displacement and angular velocity, only a few periods (perhaps 5-6) are necessary to plot, but for the phase space trajectories it will be most interesting if you take the computations out to a few hundred thousand time steps or more. Of particular interest will be the phase space trajectories. The rigid pendulum is a type of nonlinear system, and therefore the dynamics actually become chaotic for certain physical parameters and initial conditions. To best observe the chaotic behavior, restrict the values of the angular displacement to the range - ππ to +ππ , by including two if-then constructions at the very end of the loop in which you implement the Euler-Cromer algorithm. If the angular displacement θθ becomes less than -ππ then its value is increased by 2ππ . If θθ becomes greater than ππ then its value is decreased 2ππ. Since θθ is an angular variable, values that differ by 2ππ correspond to the same physical position of the pendulum. This restriction is not necessary, but will be convenient for your analysis. Describe in detail the dynamical behavior of your model as you vary the driving torque. Can you identify the behavior that corresponds to chaotic? Build a computational model of a plane undamped, unforced rigid pendulum using the Euler-Cromer method. Assume your pendulum consists of a rigid metallic rod, one meter in length, with a mass of 1kg. Also assume that one end of the rod is fixed to an immovable support, and that the rod is free to rotate without bound in a plane. For initial conditions, assume the rod is displaced at some angle, greater than 90∘, relative to its vertical minimum potential energy configuration, and released from rest. This physical situation has no exact analytical solution with which you will be able to compare the results of your computational model, so you must carefully determine a value of Δt that produces an accurate approximation without the benefit of making a comparison. Describe in detail the procedure you used in arriving at an acceptably small value of Δt, show plots of the angular displacement and angular velocity as functions of time, and comment on the pendulum’s dynamic behavior. Is the behavior of your computational model what you expect for a real pendulum? A very useful plot for analyzing periodic systems is known as a phase space plot, and is simply a graph of velocity vs. position. The resulting curve is known as a phase space trajectory. In the case of the plane rigid pendulum, the phase space trajectory is found by graphing angular velocity vs. angular displacement. Produce a phase space plot for the plane pendulum using the parameters and initial conditions you used (including an accurate value for Δt !) in Exercise 1. Comment in detail on the resulting phase space trajectory. 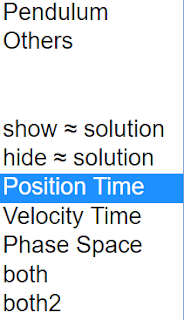 Now, add a damping term to your pendulum model. Explore, and produce graphs of (time dependent behavior as well as phase space), the behavior of the model by systematically varying the damping strength b . Use the same values for the physical parameters and initial conditions as before. Describe the effect of increasing the damping strength, while keeping the other parameters the same. Can you damp the pendulum to such an extent that it doesnâ€™t actually oscillate? 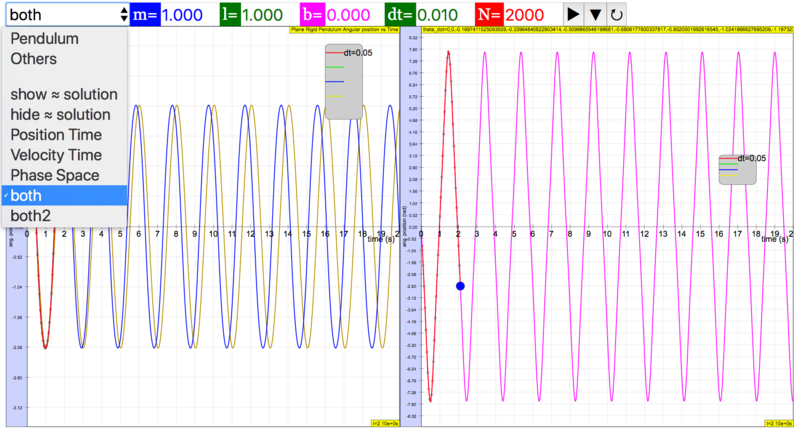 Next add a driving torque to your pendulum model. Once you’re sure that your model is accurately computing the damped, driven pendulum’s dynamics, systemically explore the behavior of the model by varying the driving torque amplitude τd . 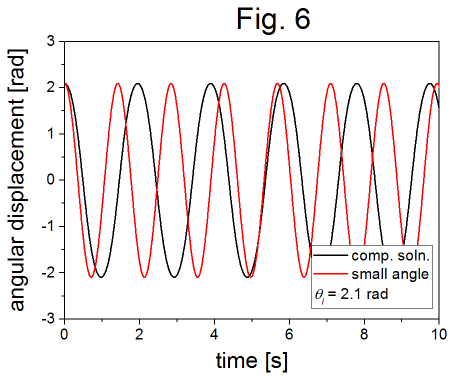 Use the same physical parameters and initial conditions as before, including values of b = 0.2 and ω = 3 rad/s for the damping strength and angular frequency of the driving torque, respectively. Then, vary the magnitude of the driving torque amplitude from 2 Nm to 10 Nm, in 1 Nm increments, producing time-dependent and phase space plots for each value of τd. For the time-dependent graphs of angular displacement and angular velocity, only a few periods (perhaps 5-6) are necessary to plot, but for the phase space trajectories it will be most interesting if you take the computations out to a few hundred thousand time steps or more. Of particular interest will be the phase space trajectories. The rigid pendulum is a type of nonlinear system, and therefore the dynamics actually become chaotic for certain physical parameters and initial conditions. To best observe the chaotic behavior, restrict the values of the angular displacement to the range - π to +π , by including two if-then constructions at the very end of the loop in which you implement the Euler-Cromer algorithm. If the angular displacement θ becomes less than -π then its value is increased by 2π . If θ becomes greater than π then its value is decreased 2π. Since θ is an angular variable, values that differ by 2π correspond to the same physical position of the pendulum. This restriction is not necessary, but will be convenient for your analysis. Describe in detail the dynamical behavior of your model as you vary the driving torque. Can you identify the behavior that corresponds to chaotic? With a properly working model, and no exact solution with which to compare, the student should look for some kind of convergence behavior in the computational solution as ΔtΔt is systematically made smaller. Figure 1 demonstrates this convergence behavior. In EJSS, Using Runge Kutta 4 as solver, dt = 0.01 to 0.05 is an acceptable time step for accuracy. The parameters used to produce the computational solutions shown in figure 1 were: g=9.8 ms2,m=1.0 kg,L=1.0 m,b=0,ω=0,τd=0,θ0=120∘,θ0˙=0g=9.8 ms2,m=1.0 kg,L=1.0 m,b=0,ω=0,τd=0,θ0=120∘,θ0˙=0. 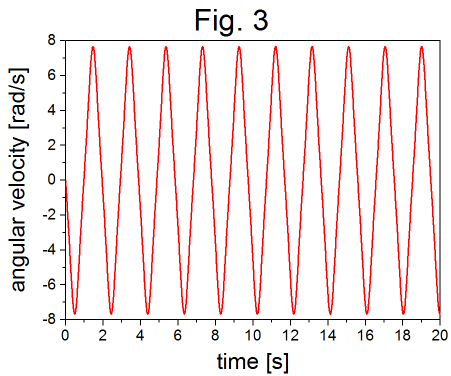 There a four curves in figure 1, that represent four different time steps. Lines are shown connecting the points that represent the discrete computational solutions. As ΔtΔt is decreased the solution asymptotically approaches a specific shape and position. Upon close examination, one can just barely see the green dots (Δt=0.01Δt=0.01) to the left of the blue curve (Δt=0.001Δt=0.001). Reducing ΔtΔt by the factor of ten from Δt=0.01Δt=0.01 to Δt=0.001Δt=0.001 does not produce a very significant change in the computational solution. Lowering ΔtΔt even further may not produce a sufficient improvement in accuracy to be worth the extra computational time required. 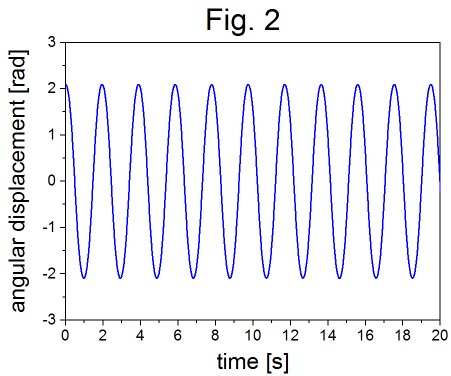 Figures 2 and 3 show the angular displacement and angular velocity, respectively, as a function of time for the parameters listed above, and Δt=0.001Δt=0.001 s.
These graphs represent the oscillatory behavior of a pendulum. The angular velocity is 90∘90∘ out of phase with the angular displacement, as expected. The parameters used for these plots were:g=9.8 ms2,m=1.0 kg,L=1.0 m,b=0,ω=0,τd=0,θ0=120∘,θ0˙=0g=9.8 ms2,m=1.0 kg,L=1.0 m,b=0,ω=0,τd=0,θ0=120∘,θ0˙=0. for the angular displacement in the small angle approximation. The parameters used were: g=9.8 ms2,m=1.0 kg,L=1.0 m,b=0,ω=0,τd=0,θ0=15∘,θ0˙=0,Δt=0.001 sg=9.8 ms2,m=1.0 kg,L=1.0 m,b=0,ω=0,τd=0,θ0=15∘,θ0˙=0,Δt=0.001 s.
i speculate the suggested answers are wrong. 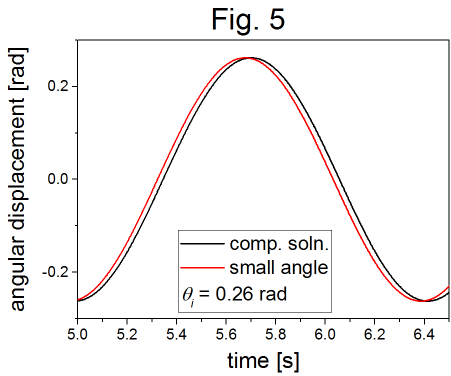 For an initial angular displacement of 0.26 radians (15∘15∘), the computational solution matches the small angle approximation well until about the 3rd or 4th period. 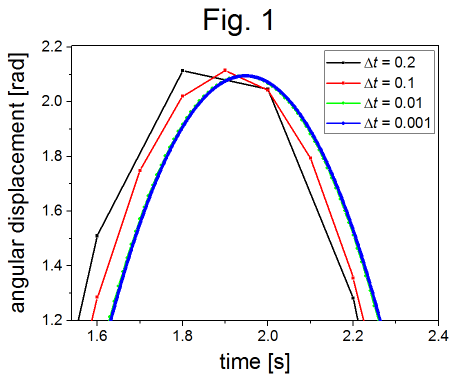 Figure 5 shows a zoomed-in view of the 4th maximum, showing that the difference between the two curves grows in time. Figure 6 shows the same comparison for an initial angular displacement of 2.1 radians (120∘120∘). There is a clear deviation between the computational solution and the small angle approximation observed at the outset. The small angle approximation underestimates the period of oscillation, and obviously isn’t a good approximation for large angles. 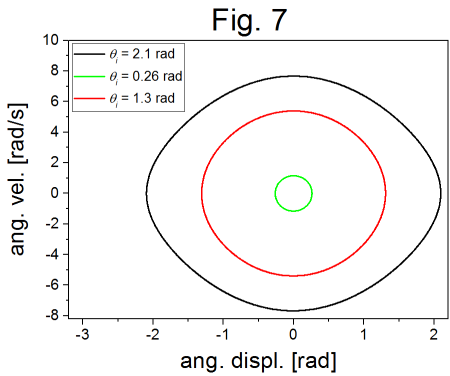 Figure 7 shows a phase space plot (angular velocity vs. angular displacement) for three initial angular displacements, 0.26 rad (15∘15∘), 1.3 rad (75∘75∘), and 2.1 rad (120∘120∘). The parameters used for figure 7 were g=9.8 ms2,m=1.0 kg,L=1.0 m,b=0,ω=0,τd=0,θ0=120∘,θ0˙=0,Δt=0.001 sg=9.8 ms2,m=1.0 kg,L=1.0 m,b=0,ω=0,τd=0,θ0=120∘,θ0˙=0,Δt=0.001 s. For the undamped, unforced SHO, the phase space trajectory is a well-defined closed path. It should also be emphasized that there is a direction of circulation around the closed orbit, the direction of which depends on the initial conditions. 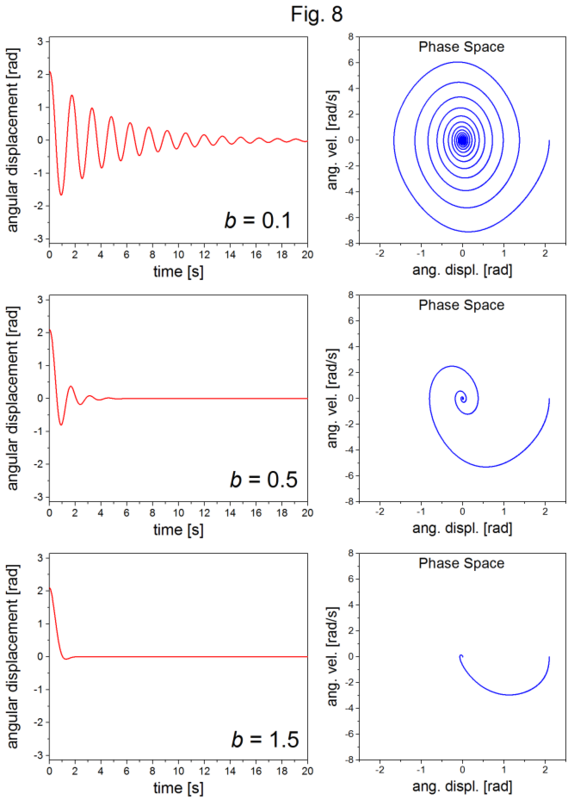 Figure 8 shows the angular displacement and corresponding phase space plots for three different values of the damping strength, as labeled in the figure. The other parameters used were g=9.8 ms2,m=1.0 kg,L=1.0 m,ω=0,τd=0,θ0=120∘,θ0˙=0,Δt=0.001 sg=9.8 ms2,m=1.0 kg,L=1.0 m,ω=0,τd=0,θ0=120∘,θ0˙=0,Δt=0.001 s.
As expected, the oscillations become damped, and the corresponding phase space trajectory spirals in towards zero as the energy approaches complete dissipation. For a value of roughly b=1.5 kgm2sb=1.5 kgm2s and above, there are no longer oscillatory solutions. Figure 9 shows shows the angular displacement and corresponding phase space plots for three different values of the driving torque as labeled in the figure. The other parameters used were g=9.8 ms2,m=1.0 kg,L=1.0 m,b=0.2 kgm2s,ω=3.0 rad/s,θ0=120∘,θ0˙=0,Δt=0.001 sg=9.8 ms2,m=1.0 kg,L=1.0 m,b=0.2 kgm2s,ω=3.0 rad/s,θ0=120∘,θ0˙=0,Δt=0.001 s. The phase space plots were generated with 200,000 time steps. For the lowest value of the driving torque, after the transient response, the system settles into predictable oscillatory behavior, and a well defined elliptical orbit in phase space. 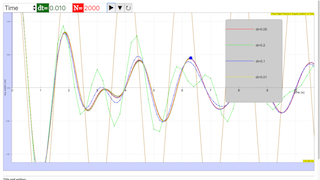 But, with higher driving torques, the system shows an apparently unpredictable non-repeating oscillatory behavior, with the corresponding phase space characterized by many orbits that can appear, as the case of τd=5 Nmτd=5 Nm, to be completely random. This behavior is chaotic. Though chaos identification is beyond the scope of this exercise set, the phase space results of Exercise 5 provide a good opportunity to demonstrate to students the chaotic coincidental nature of deterministic solutions and unpredictability. Pendulum and Others will give you their fieldboxes that are editable. Toggling the bottom options will toggle their visibility. 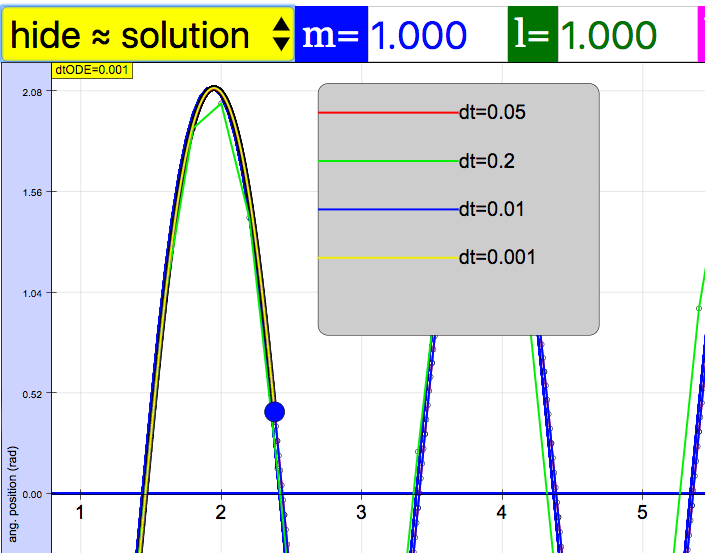 Toggling the Solution will toggle the visibility of the orange curve. Selecting the rest of the options will toggle the visibility of the above graphs. Plays/Pauses, initialises and resets the simulation respectively.